South Korea’s major banks saw their household loan balance climb at the fastest pace in almost two years in August, propelled by the mortgage loan uptrend amid the robust real estate market here, said industry officials on Tuesday. The household loan balance of the nation’s top five banks -- KB Kookmin, Shinhan, Woori, KEB Hana and Nonghyup -- stood at 552.39 trillion won ($495.7 billion) as of end-August, up 4.65 trillion won from a month earlier. This on-month increase was visibly higher than the on-month average in January-July, which was 2.78 trillion won. 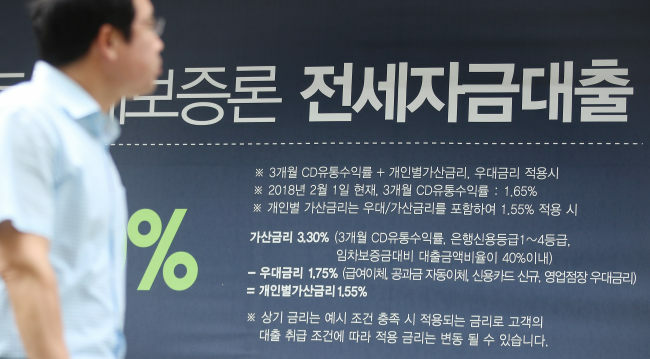 While credit loans accounted for 103.51 trillion won, up 900 billion won from the previous month, outstanding home-backed loans recorded 392.28 trillion won, up 2.88 trillion won from the previous month, marking the largest monthly increase since the 3.16 trillion won jump in November 2016. The surge in mortgage loans came in line with the recent upswing in the Korean real estate market, especially in apartment prices in Seoul. The average apartment price in the capital rose 1.17 percent in August from a month earlier and 7.37 percent from the same period last year, according to a monthly real estate report issued by KB Kookmin Bank. Seeking to curb the market prone to bubbles and to promote taxation equity, the government recently gestured at further tightening taxing rules on owners of multiple homes and high-priced properties. However, as the government’s actions are likely to take shape later in the year, the signal had the effect of encouraging speculative purchases while the market remains heated. Also, banks saw a rise in the “jeonse” rent loan, which is exempted from loan-to-value restrictions and offer more lenient loan conditions. Jeonse, a home rental system unique to South Korea, involves a lump sum deposit instead of monthly rental fees, which is to be returned to the tenant once the lease expires. The jeonse loan was originally designed to allow tenants to borrow their lump sum deposit but it is frequently used to secure more cash in apartment purchases. Loans to owner-operators also rose to 215.7 trillion won, up 2.7 trillion won from the previous month, marking the largest on-month increase in five months, officials said. Pointing out that such business loans might have been used in real estate speculation, financial regulators recently vowed to tighten their grip over loan screening processes and to filter out irregular use of the money.